It was A's birthday recently, and among the treats which various people stored up for him, A's mum P cooked up a wonderful traditional Jewish lunch for A & C (and A's dad J). 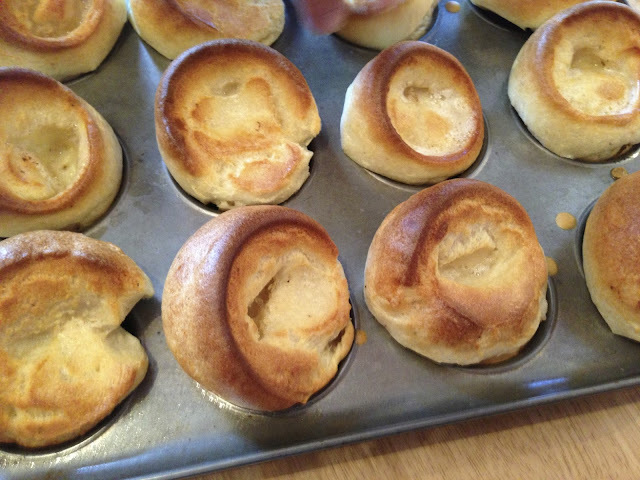 P is a great cook and, frankly, it was too good not to write about. P really pushed the boat out, starting the meal off with a couple of home-made starters. First off, she made baba ganoush - a Middle Eastern paste made up of aubergines, garlic and spices. P added a couple of extras to her version in the form of fresh pomegranate seeds and a bit of tahini, and the results were fantastic; the two extras gave the dip an extra depth of flavour, with slightly stronger tart and bitter notes than A's version, and it was certainly lighter on the garlic too. We definitely approved. P also made egg and onion, a traditional Ashkenazi dish made with hard boiled eggs and onions. 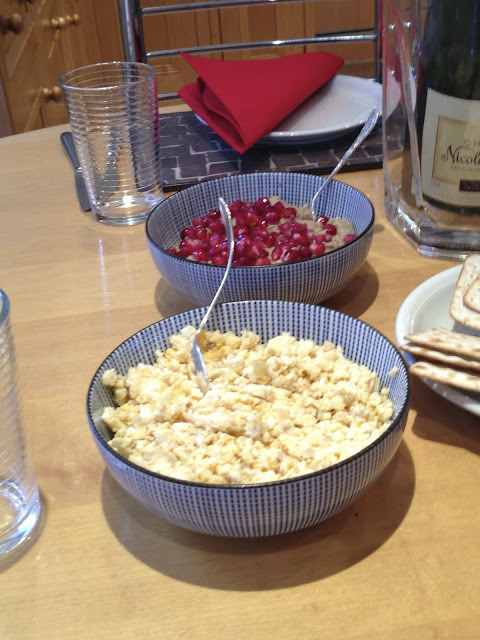 As with many traditional Jewish recipes, there are about as many ways to make this as there are Jewish families, and P has developed her own recipe. Unusually, P fries white onion in simulated chicken fat (a kosher product which is used in milky dishes to replace real meat fat), before adding the egg. This stands in stark contrast to the way A's grandmother, S, prepares the dish; she uses raw spring onion, which produces a wholly different result to that of P's version. While this stuff doesn't leave one's breath smelling the freshest, the egg and onion combination is a Jewish classic and is certainly very tasty. C, who had never tried egg and onion before, was extremely impressed and is looking forward to the next round (not that she's hinting at all, P...!). This was served up with Matzo, the traditional unleavened bread eaten at Passover to remind Jews of the exodus, but available all year round. 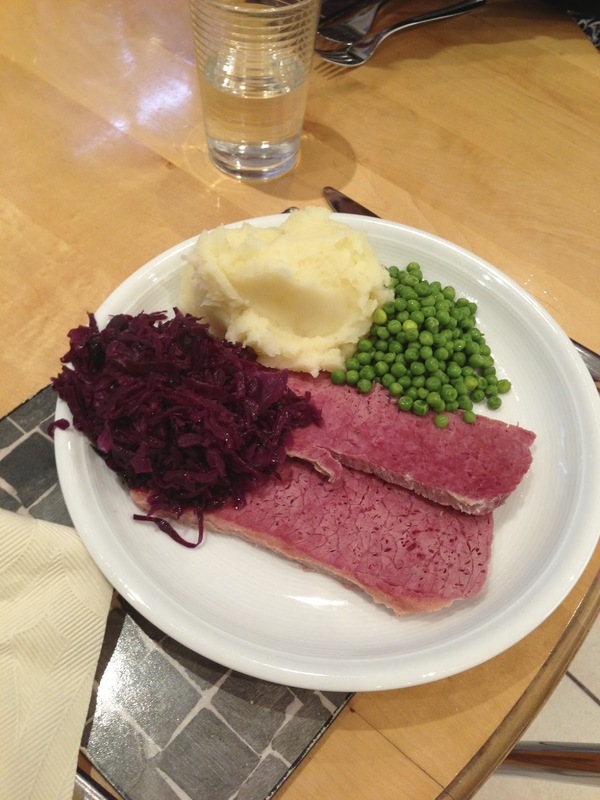 The main event was salt beef with red cabbage, peas and mash. Again a Jewish classic, and well known to many inhabitants of the East End due to the popular bagel bakeries on brick lane (we're particular fans of the 24 hour bagel shop), P gets her salt beef from an Italian butcher in Cricklewood who is well used to supplying meat to a Jewish clientele. Essentially a piece of pickled brisket, which is slow boiled in water, the dish is as classic as it comes and especially when served with chrayne, a purple beetroot and horseradish paste which replaces mustard on many Jewish tables. 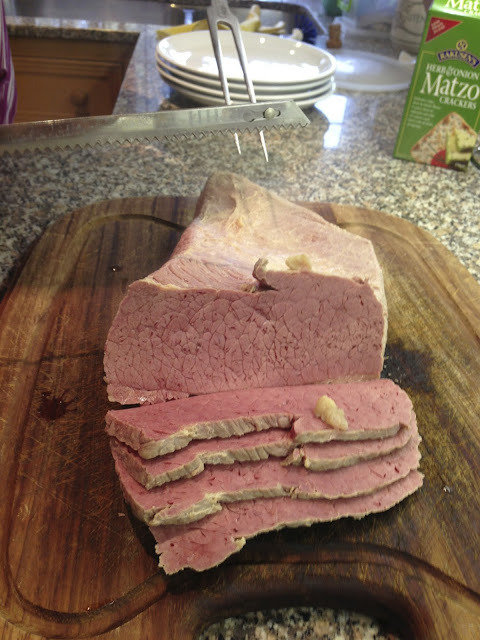 The flavour of salt beef is truly fantastic, and when properly slow cooked it comes out beautifully soft and flaky. C is still a newbie to this kind of food (although she once had a salt beef bagel with A, and has also sampled the excellent salt beef dish at Smiths of Smithfield) and couldn't get enough of the stuff; the large piece of meat was seriously depleted by the time everybody had had their seconds. 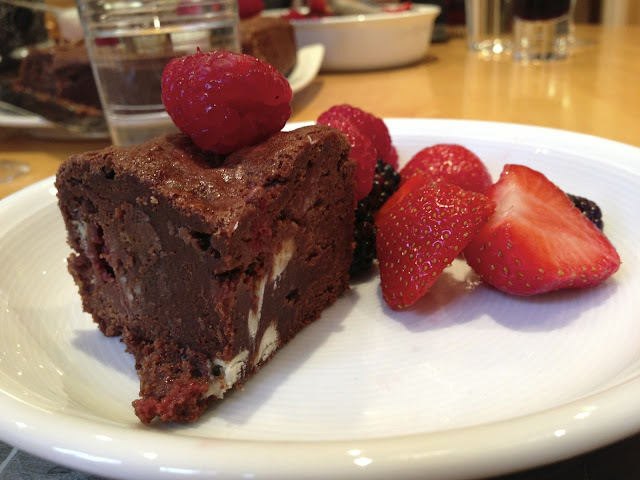 For dessert, P served up a white chocolate and raspberry brownie, with fresh fruit and fruit sorbet: the brownie was gooey and delicious, and were complemented perfectly by the sharp fresh flavours of the fruit and the sorbet. Though not a traditional Jewish dessert, it rounded of the meal perfectly. 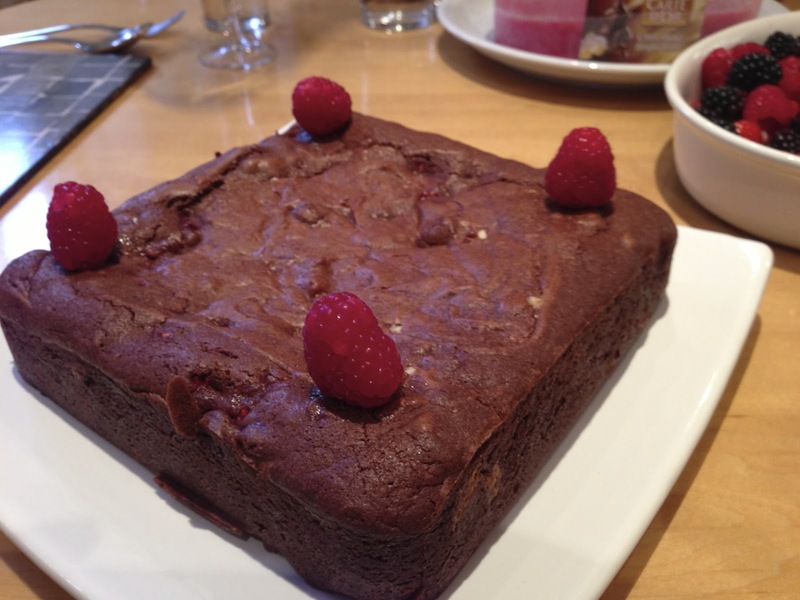 P's baking was outstanding, and the choice of elements to the dessert was not only among A's favourites, but as ever with P's cooking, was of the highest order. Thanks P, from A & C!